2008. Always one of the most popular artists on the Hypnos and Binary labels through the years, Saul Stokes is also one we've been very proud to "launch" into the ambient/electronica world. The first new work by Saul Stokes on Hypnos/Binary since Fields in 2005, this is certainly one of the most hotly-anticipated discs we've released in years. 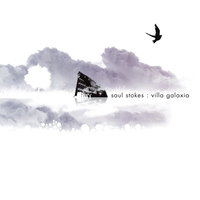 Stokes’ 8th solo album to date, Villa Galaxia is a hyperfusion of sonic exploration seeded in Stokes’ seminary music past, while arcing into a completely new genre defining collection of songs. Stripping away any notion of ambient drone or chill out labeling, Villa Galaxia surfs its own ocean of contemporary electronic music culture with eccentric listenable experimentalism wrapped in catchy lyrical orchestras of electronic fireworks.